You requested a coal-fired power plant and here you get two for the price of one: the South and North units of the George Neal Power Complex located in rural Woodbury County in western Iowa. These generating stations power a considerable portion of the agricultural economy in the heart of the Corn Belt, and they’ve survived flooding, explosions, tornados, and consent decrees. In the foreground of the shot is Browns Lake, an ox-bow lake marking a vestigial course of the Missouri River that today flows in a man-made channel barely visible on the far side of the two power plants. The influence of human activity on the landscape represented in this photo is all encompassing: the course of a major river, the massive piles of Wyoming coal, the forest cover on the Nebraska hills in the background, the massive industrial complexes, and the farm fields that cover most of the ground are all anthropocentric artifacts. Only the ox-box lake and the wetlands on the interior of the loop are remnants of the natural world, and even they are heavily influenced by the power plants since they are part of the water management process that cools the outflow from the facilities. What’s next in this sub-series of power plants—a hydroelectric dam perhaps? Drop us a note if you have any good ones to share: hello@theatlantic.com. In August, Iowa begins to change. We still have the beautiful green from the crops that thrive in our soil, while colors are beginning to change as we approach harvest. In this picture taken near Mason City, Iowa, you can see much of what it means to live in America’s heartland. The pride of the people who care for the land jumps out at you. Large farm equipment stands at the ready, and the classic car near the Quonset hut barn makes it easy to believe you are viewing a scene from the past. Seeing this perspective, both the history and the new growth, is a special feeling. The farm has an aviation connection: In 2000, the Mason City Airport was planning an expansion, and the location of this farm—not far off the end of one of the runways (you can see one runway at the top-left of the photo)—meant it would need to go. But people fought back, and 16 years later the farm is still there. As a pilot, I’m a big supporter of airports, but I’m happy to have this view when landing at that great airport. With their fantastic photo, Ray and Cindy also cross Iowa off our list of 50 states to cover for America by Air. We’re now down to single digits—CT, GA, ME, MS, NM, ND, RI, VT, WV—so if you have a great aerial view from one of those states, please send our way. I saw your article and thought you’d find interesting the enclosed photo I took out the window of a Southwest flight on the evening of July 23 flying north from San Diego to San Francisco. It was extremely clear and I saw what I think is the first day of the fire out the window. The fire was very bright but still somewhat small, and I think I could see backfires started by the firefighters. It’s a remarkable sight because during my 50 years in California I’ve seen many brushfires from the air but never was the view this clear; normally they are obscured by the smoke. At its peak last month, more than 5,600 firefighters were working to put out the blaze. It’s destroyed 57 homes and threatens another 400. And all of this because someone left a small campfire burning while visiting Garrapata State Park. The lake—the deepest one in the U.S.—formed around 7,700 years ago when Mt. Mazama collapsed after a massive volcanic eruption, one that was 42 times greater than Mount St. Helens in 1980. The resulting caldera is what you see above (and in this Orbital View). Rain and snowfall fills the caldera, and no rivers flow into or out of Crater Lake, so it takes about 250 years for the total amount of water to cycle out. A 33-mile road, Rim Drive, wraps around the lake, and my first long bike ride happened to be around it, in the summer of 2010. The gorgeous locale and sunny weather of that day was only dampened by the timing of the ride—just a month after my brother got into a terrible bike accident in Portland that resulted in several broken teeth and nearly a broken neck. His bashed-up face loomed in my head as I raced down Rim Drive to catch up with the more experienced cyclists. Every tiny rock on the road felt like a speed bump, and my clenched hands were sorer than my legs by the end of the ride. But my brother is braver than I am; he was back to his long bike commutes in no time. We’re down to the final stretch of U.S. states in this series, so if you happen to have an aerial view above CT, GA, IA, ME, MS, NM, ND, RI, VT, or WV, please send it our way. By Jim Urquhart / Reuters. (My camp was right next to that fluorescent orange one in the middle right, the latter called “Comfort & Joy.”) More photos of Burning Man 2016 are compiled here by Alan Taylor. After landing in the dust storm, I struggled to keep up with my friend heading to our camp by bicycle with an 80-pound pack on my back and many beers in my belly (like I said, it was a long wait in Reno). Not being able to see 20 feet in front of me made for a surreal, somewhat perilous ride; my friend stopped so abruptly that I bumped right into him. If you happened to capture any good photos of Black Rock City this year (I personally took a vacation from my iPhone and didn’t bring my SLR due to dust danger), please send our way: hello@theatlantic.com. I was on a hiking and biking vacation in Ketchum, Idaho, and decided to try paragliding (much to my wife’s chagrin) after watching several gliders launch from the summit of Mt. Baldy, the major ski mountain in the valley. I contacted Fly Sun Valley, the only licensed paragliding outfit in the area, and made arrangements for a tandem flight the next evening before sunset. The flight was incredible. We sailed for 25 minutes, launching from Baldy’s summit and heading west while we gained another 1,000 feet of altitude, and then turned and came back across the mountain at 10,000 feet and slowly began descending into Sun Valley, making a series of lazy circles before landing in a large field just outside of Ketchum. I was able to take many pictures on my iPhone (permissible, but I was warned that several phones had been dropped, never to be seen again) and even shoot a video. The experience was wonderful—a great perspective to see a beautiful part of America. Ketchum and Sun Valley seemed to weather the financial crisis just fine, and the folks that manage and plan the community should be applauded for avoiding quick-fix solutions to economic downturns. They’ve invested for the long-haul, sacrificed some quick pay-offs to preserve the scenic nature of the valley (which will yield a long-term payoff I think … ), and are turning the resort into a legitimate four-season destination (mountain biking will be as big as skiing someday soon). In this they are following the lead of other major resorts, such as British Columbia’s Whistler. Dare I say that it sounds like business is really … taking off? If you’ve got an aerial snapshot to share, particularly one above CT, GA, IA, ME, MS, NM, ND, RI, VT, or WV, please send it along. And sometimes we passed localized rain showers, always keeping a respectful distance. Here is how the area just over the Lancaster airport, in the heart of the Amish country of Pennsylvania, looked at about 4 p.m. on Wednesday, from 10 miles to the east, outside the rain. What looks like a cloud reaching all the way to the ground, off the plane’s wingtip, would have seemed to people in Lancaster to be a drenching downpour. The gray you see reaching from cloud to ground is rain. From the ground, it’s hard to see or imagine weather other than what is affecting us at the moment. From a distance in the air you can see, godlike, the movement of different weather across the land. Taken on a recent trip from GSO to MDW [Greensboro, North Carolina, to Chicago, Illinois], this photo shows the Indiana Harbor and Ship Canal in northwest Indiana, including ArcelorMittal (originally Inland Steel), the Whiting BP (originally Amoco) refinery, etc. I grew up on the far South Side of Chicago, not far from here, in the ’70s and early ’80s, when the “rust belt” was beginning. Bulk commodities that pass through the harbor ... generate $332.M annually in direct revenue while supporting 1,495 direct, indirect, and induced jobs that produce $263.M per year in direct income. Pretty impressive, Indiana. If you’ve got a photo to share—particularly one from CT, GA, ID, IA, ME, MS, NM, ND, RI, VT, or WV—let us know. That “1939 airplane” is a Beech Model 17 “Staggerwing” biplane, and I think it is the most beautiful single-engined propeller driven aircraft ever produced (although the Supermarine Spitfire is very closely competitive). The Staggerwing is, truly, Walter Beech’s masterpiece. Notice how the upper biplane wing is mounted aft of the lower, a rare feature called “negative wing stagger” that gives the airplane its unique appearance and grace. Next time you are in DC, wander by the National Air and Space Museum on the Mall and make your way to the Golden Age of Flight gallery. Therein, a yellow Model 17 is suspended for your examination and admiration. Thanks for the series; the photos are great. There were relict streams that once drained into the original Everglades that are now submerged due to sea level rise that took place over the last 2,000 years. Many archaeological sites, low-lying mounds, are present along these now submerged streams, sites that we were working on at the time of this trip. The area south of the lake is a low-lying plane with limestone bedrock barely two feet beneath the current ground surface. And it is only several feet above sea level. This picture shows a good view of a 2,000-year-old house mound located not far from one of the relict stream channels. One of the access roads for the sugar cane fields made a U-turn around it to avoid its destruction. The first picture shows the magnificent Delaware Water Gap, where the Delaware River cuts through Kittatinny Mountain (along with I-80). I am flying over Pennsylvania, looking east towards the gap, which is in Warren County, NJ. Here, I am crossing from South Carolina into Georgia, setting up to find, then land, at Plantation Airfield. Plantation is an old Army-Air Force training field with the typical triangular runway layout. Most of the fields from South Carolina down to Clewiston were once training fields first built in the early 1940s. Plantation was largely a duster field when I passed through. Little did I know that my engine was to quit after I crossed the Savannah River and had the field in sight. I landed it like a glider! Here’s a shot of a horse race track near Ocala, Florida, which is a thoroughbred breeding area of note in the U.S. There were horse-racing tracks everywhere I looked in the Ocala area! When I was flying back through Georgia, my horizon was occluded by haze, the interminable summer haze, and I realized that I was off course. So, using an old airmail pilot’s expression, I “buzzed” a water tower in a small town that I did not recognize. The tower had its name prominently displayed: Glenville, Georgia! Airmail pilots would “shoot the station,” meaning a railroad station, to determine where they were (they used road maps back then). Since I was trying to pay attention, I did not take a picture of the Glenville water tower, but when I crossed into South Carolina about an hour later, I snapped a shot of the prominent water tower in the small town of Allendale, South Carolina—which, of course, had the town’s name on it too! So, I was “shooting the tower,” so to say, as a form of navigation on the way back. Hi. This is a view from a helicopter of a riverboat near Opryland in Nashville, TN [on the Cumberland River]. It was taken in February 2004 during a ferry flight from Seattle, WA to Newport News, VA. Hope this helps. Indeed it does; Tennessee is on our dwindling list of states that haven’t been covered in America by Air. Only 13 remain now (CT, GA, ID, IN, IA, ME, MS, NM, ND, RI, TN, VT, WV), so if you have a good aerial view from one of those states, please shoot it our way. Once we get to zero, I’m thinking of a launching a similar series of photos outside the U.S. This photo was made in 2005 between Waterloo, Iowa, and the Minnesota border. That trip took me Japan and Korea to take photographs for Camp Adventure (youth camps/programs) sites on U.S. military bases. I recall Mesaba Airlines (Northwest Airlink) flew Saabs then. 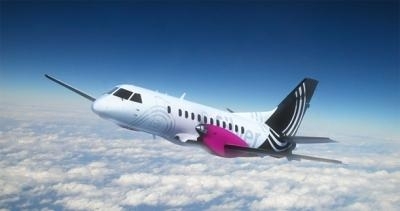 The plane looks to be a turbo prop Saab 340A [photo here]. The 340A’s engine is above the wing and the shape of the rear of the engine seems to match the one in my photo. I enjoyed these short rides to Minneapolis. The turbo-props gained altitude quickly and you seldom lost sight of earth, which was always interesting to watch.